Over the last 20 years, ecotourism to view and interact with marine megafauna has become increasingly popular (Higham and Lück 2008). Examples of this type of tourism include turtle and whale watching, snorkelling with seals and shark diving (Jacobson and Robles 1992; Anderson and Ahmed 1993; Orams 2002; Kirkwood et al. 2003; Dearden et al. 2008; Dicken and Hosking 2009). The occurrence of many aggregations of megafauna along the coasts of regional areas remote from centres of population means that such tourism also provides significant flow-on effects and diversification to local economies where few alternative sources of income exist (Milne 1990; Garrod and Wilson 2004). Importantly, the development of a well-managed ecotourism industry based on megafauna provides the opportunity for local people to utilise natural resources in a sustainable manner over the long-term (Mau 2008). The economic value of tourism based on marine megafauna is enormous. In 2008, a study of whale watching estimated that this form of tourism was available in 119 countries, involved approximately 13 million participants and generated an income to operators and supporting businesses (hotels, restaurants and souvenirs) of over US$2.1 billion (O'Connor et al. 2009). This industry is estimated to have the potential to generate annual revenues of over US$2.5 billion (Cisneros-Montemayor et al. 2010). The development of whale watching has been paralleled by growth in tourism based on other types of marine megafauna. In particular, tourism to observe sharks and rays has become increasingly common. At the forefront of this relatively new market are industries that focus on whale sharks (Rhincodon typus) with estimates calculated in 2004 suggesting that these generated more than US$47.5 million worldwide, providing important revenues to developing countries such as Ecuador, Thailand and Mozambique (Graham 2004). Diving with other species of sharks has followed a similar trend of growing popularity. In 2005, it was estimated that approximately 500,000 divers were engaged in shark-diving activities worldwide (Topelko and Dearden 2005). An increasing range of opportunities for this type of tourism are available, including cage diving, shark feeding and drift diving with reef and oceanic sharks. 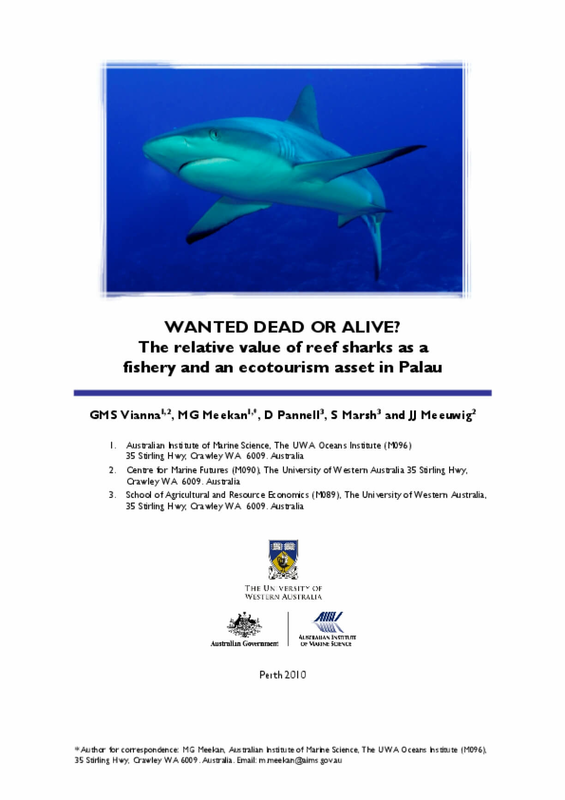 Shark-diving tourism can be found in more than 40 countries (Carwardine and Watterson 2002), with new destinations and target species being established rapidly, due to the increasing recognition of the economic potential of this activity (Dicken and Hosking 2009; De la Cruz Modino et al. 2010).